The kerfing plane is sort of done. I did some bad thinking and ended up with a less than elegant shape for the handle, but it works better than it looks. 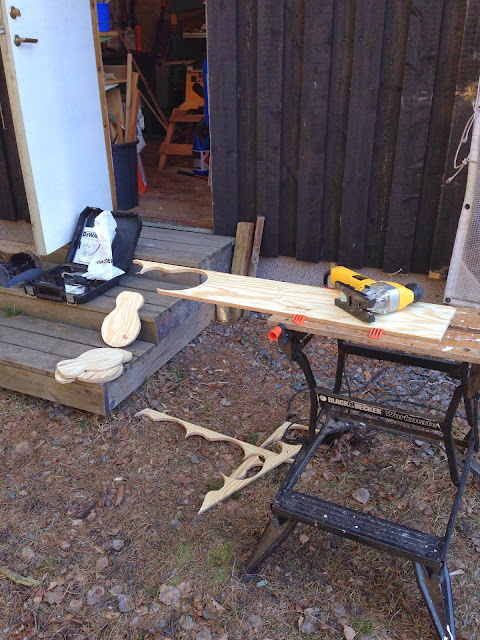 In the first picture you can see the kerf I made along one edge of a board. Tom Fidgen adapted his to have an adjustable fence, and that is of course useful. 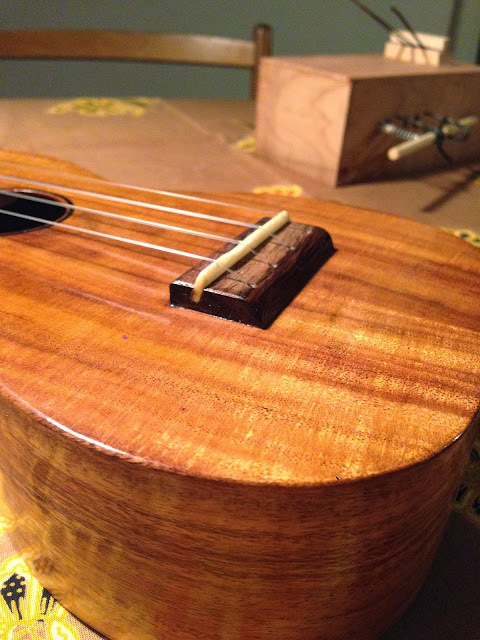 Mine is set to slightly more than 3 mm and that is fine for uke body material, but a bit thin for fretboards. Here you can see how I rip the board after putting a kerf around all edges. Believe it or not, but this rip saw has been subject to ridicule from my daughter Li. I can't see why. I saw the best series of youtube vids, from Tom Fidgen. 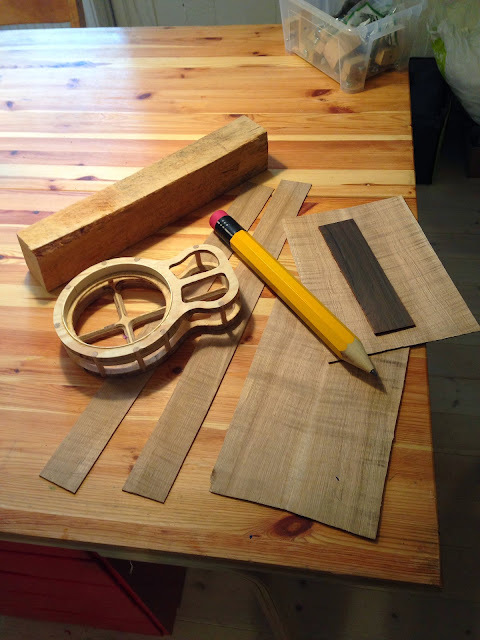 He has some great ideas about resawing by hand, and shows how he builds a frame saw and a "kerfing plane". An image search will show you his. My large bandsaw is broken, and I did buy that Pax rip saw for resawing. 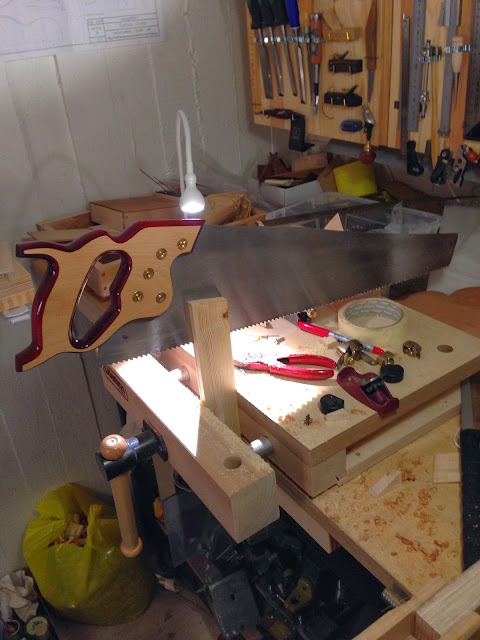 But scoring the perimeter with a gauge hasn't been enough to guide the saw perfectly. 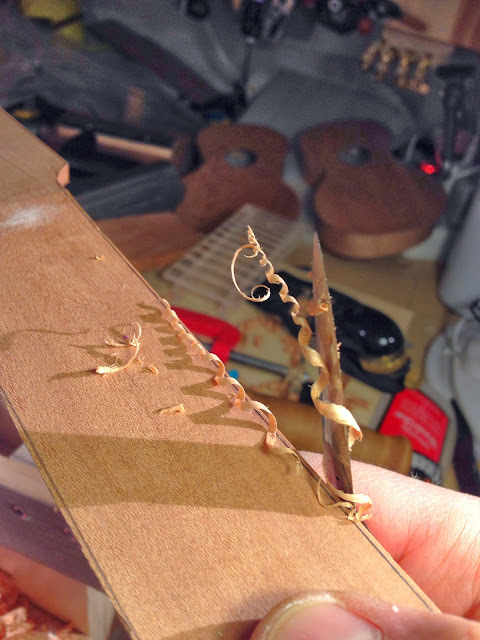 The advantage of the kerfing plane is that it cuts a deeper kerf at a set distance from the face of the board, and that kerf guides whichever saw you use for ripping. Oh well - you see where this is leading don't you. 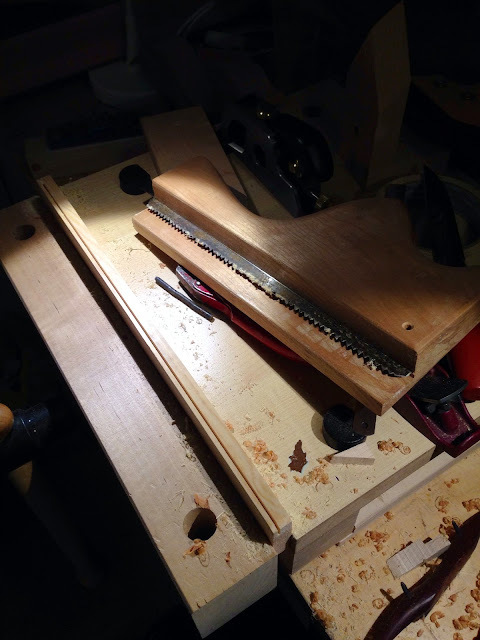 I am building my own kerfing plane. Even though I have other stuff to do. 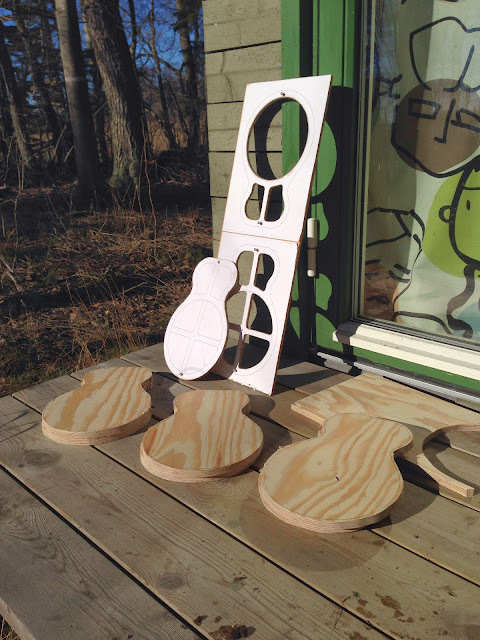 I found some plywood of the same kind I used for the first six reso ukes, and even better - I found the router templates! My band saw is still up the creek (I can't find a damn driving belt short enough) so I roughed out the contours with a jig saw. Next step will be (and I write this down for myself so I won't forget it) attaching the template for the outer edge and running it against a flush cut router bit. The router will be mounted in a table. Then half of the blanks will get the large hole for the soundwell routed out, and the rest will get to keep a cross to strengthen the back. Then the top halves will get another layer of plywood... Or will they get that even before the contour is cut flush? Oh my, I don't remember how I did it last time. I'll have to check my own blog to see if I took any pics of the proceedings then. I've sanded the wood for the last resonator of the batch I started so long ago. It'll be the sixth and it's going to my friend Andy. Well the two piccolos I attempt to build with abrasives are coming along. The tops are braced and glued to the sides so it was time to start the necks. 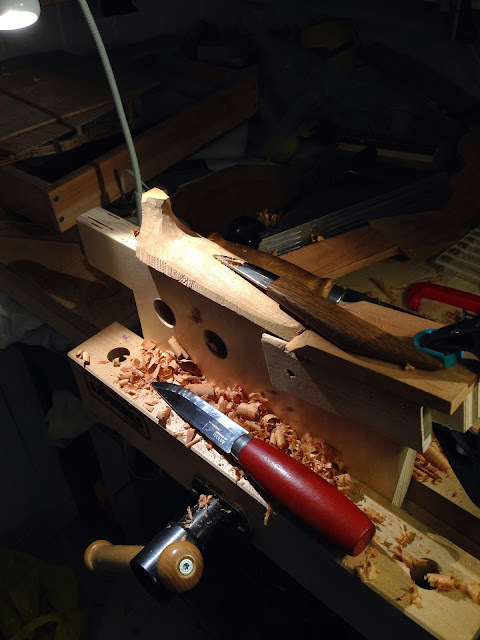 I started out with the drawknife, the on for a bit with the small contour plane (similar to a spokeshave) and then the large carving knife and the smaller whittling knife. All knives mentioned are Swedish. And dirt cheap. I say this because I am a bit disappointed with my more expensive knives. I have a few Hock violin knives and a Japanese very beautiful kiridashi, but much as I try to love them they are simply not as good as my cheapo Swedish knives. I started out today by sharpening the ones I was going to use on Japanese waterstones (and they are way, WAY better than any Swedish stones). Went through 1000, 4000 and 8000 grit before stropping them on leather charged with honing compound. 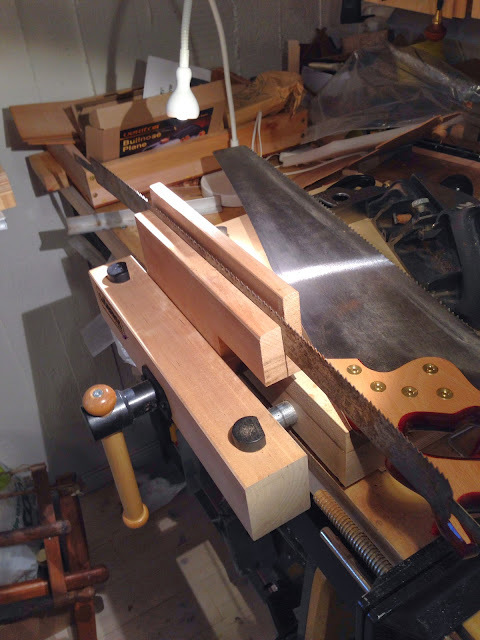 They were sharp even before, but since I won't sand these necks I wanted not only scary sharp but mind boggling sharp. And off I went. 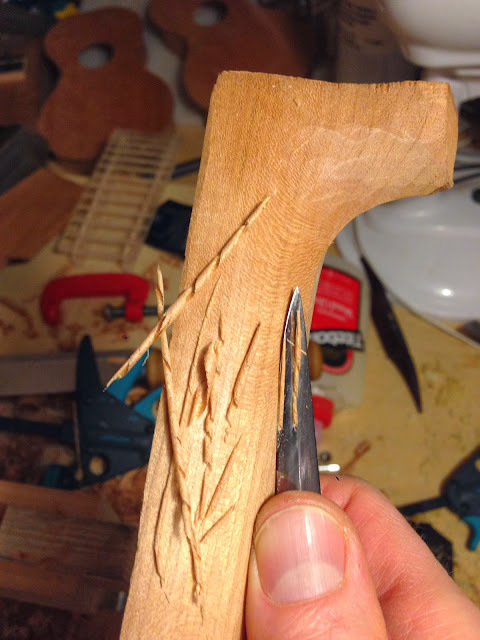 Not even the heels with the end grain put up a fight - the knife went through like a ray of sunshine through a dark room. You may notice I hold the neck in my hand. 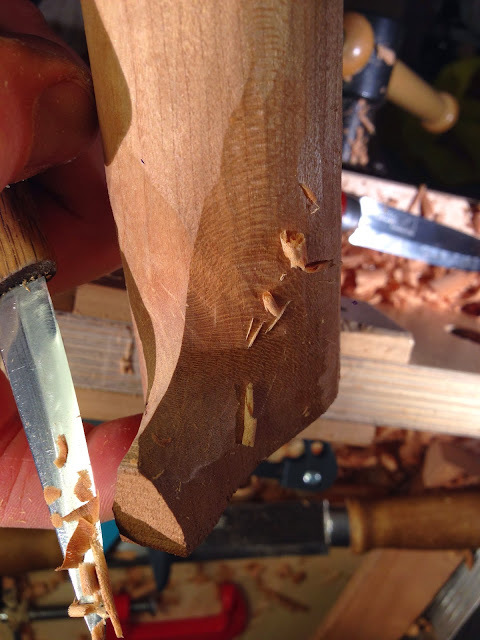 The jig I usually have the neck clamped upon is very good but I needed to feel the grain more directly before and during every single cut here, to make sure the surface is as good as I can possibly get it. Remember, no sandpaper to cover the traces! Then my mind wandered a bit (it's our wedding day after all) so I only sort of finished one of them. I'll leave you with this shavings picture. 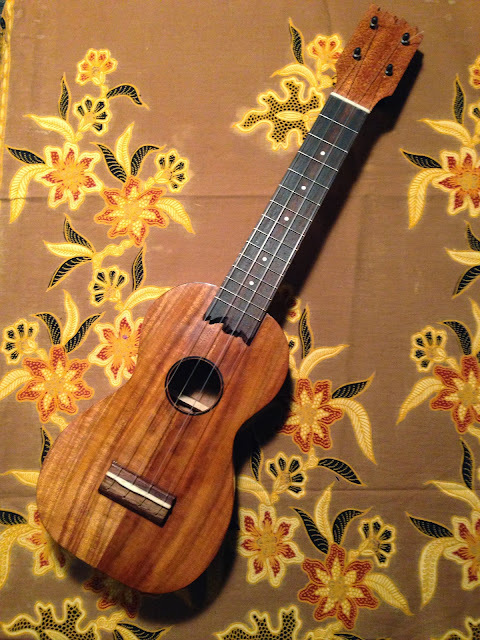 Here it is, the koa soprano that is the 70th ukulele I've built. This one is for a childhood friend and I am really pleased with the result. 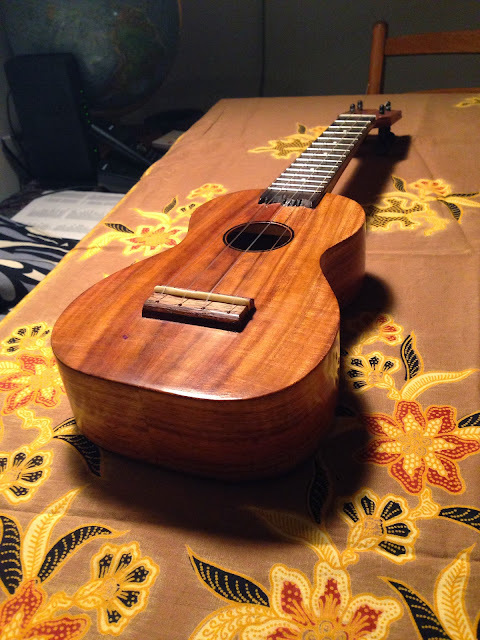 The neck is sapele, it goes well with the koa but was more difficult to carve than mahogany. 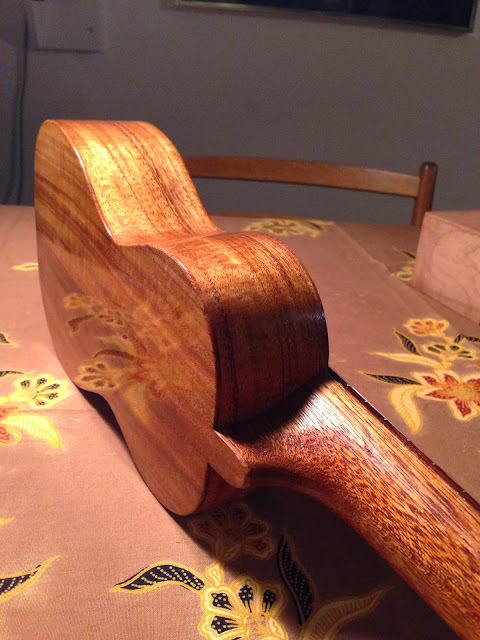 You might guess I'm pleased with the finish! The fretboard end looks a bit ragged doesn't it? I winged it because I was a wee bit tired of my usual style. If you think it's bad, you ain't seen nothing yet! 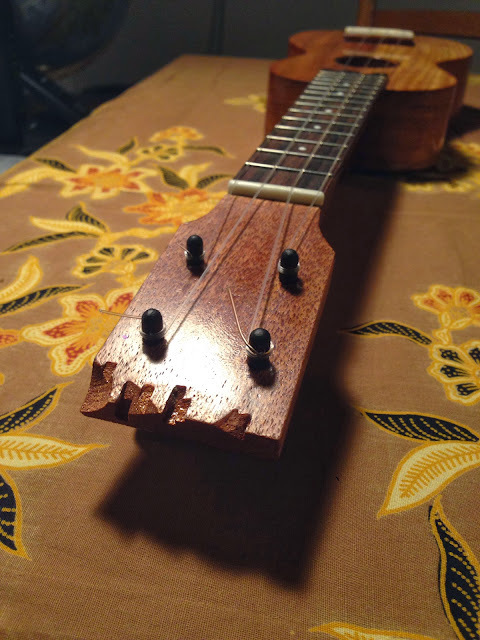 Go on, we all know ukes look like this after you've opened a few beers with them. I thought it was a brilliant idea to make it jagged from the start. Well at least the bridge is clean as always.